Ridgway presents two works, Prada Vertoog and Boogie Woogie Migration. The former is a combination of a 17th c. ‘Toogkast’ (a cupboard for storing valuables, linens) and a bootleg video of Rem Koolhaas’s Prada flagship store, made with a hidden video camera. Both are successful export products of the cultural currency ‘Dutchness’, one historically, the other present day. The second piece refers to Mondrian’s painting by cutting up and combining the Dutch and American flags. 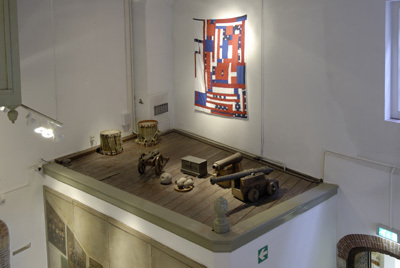 Ridgway has articulated Nederland 1 into a new flag, quilt that subtly waves above the canons and artillery in the Gouda Museum. Nederland 1 is an exhibition and parallel program at the Gouda Museum in which artists chose a position in respect to the recent developments in the Netherlands. The inspiration for this project are the many reflections from diverse media regarding the changed zeitgeist in the Netherlands during overwhelming globalisation. Nederland 1 shows how artists respond to these questions through the works as well as the process in a time coloured by the impact of recent events and societal developments.